(5 April 2019) On 1 and 2 April EPSU participated in and contributed to activities in Utrecht and Brussels which were linked to a range of activities of trade unionists and trade unions in relation to World Health Day (7 April), but also – as in previous years – to mobilisations of trade unions organising health and social care professionals and workers as well as civil society organisations representing patients, users of social services and citizens which all are united by the aim to defend the public service logic as well as the general interest orientation of health care and social services and to fight against (more) privatisation, marketisation and commercialisation in this sector across Europe. On 1 April, representatives of the members’ parliament and activists involved in a working group of EPSU’s Dutch affiliate FNV Zorg en Welzijn in Utrecht organised a workshop on European issues (FNV Actualiteitencollege “De staat van de zorg in Europa”, cf. invitation and agenda in Dutch). It focused on the main legislative and policy frameworks and policy initiatives at EU-level that affect health care and social services and on trade union work and campaigns to address, fight and/or reduce the negative impacts of privatisation, marketisation and commercialisation in the sector. It was attended by about 40 Dutch colleagues. Speakers included John Lister, editor of the journal “Health Campaigns Together” – embedded in the broader movement and campaign “Keep Our NHS Public”, Jan-Piet Bauwens, Federal Secretary for the Not-For-Profit Sector, SETCa/BBTK, Belgium, Kitty Jong, Deputy President, FNV and Mathias Maucher, Policy Officer “Health and Social Services”, EPSU (see his presentation). On 2 April, EPSU participated in Brussels in a demonstration “Our Health Is Not For Sale – Fighting Together For Health And Social Protection For All”, together with about 1,000 trade union colleagues mainly from Belgium, but also from the Netherlands as well as civil society activists also from France, Italy and Spain in their fight against more privatisation, marketisation and commercialisation of health care and social services. The rally was followed by the conference “Our health is not for sale! How to prevent commercialisation and privatisation of health in Europe” in the European Parliament, hosted by MEP Philippe Lamberts, organised by the European Network against Privatisation and Commercialisation of Health and Social Protection and moderated by Yves Hellendorff, National Secretary, CNE Non-Marchand, Belgium. EPSU spoke at the event to represent the workers in health care and social services and the trade unions organising them. You can read the press release on the day and EP event here in EN and FR, find the agenda in EN and FR here and can read the background documents prepared for the conference and put together in the brochure "For our health" here in EN and FR. You can watch the recording of the livestreaming here. You find more information on the activities linked to World Health Day here in EN and FR. You can have a look at the slide set Dr. Sabina Stan, Dublin City University, used in her presentation on the "Impact of European policies on the commercialisation of health" when focusing on the role and impact of the European Semester and of Country-Specific Recommendations for Germany, Ireland, Italy and Romania in the last years. • EPSU’s message is a simple one: Invest in quality healthcare for all + Stop the treatment of health as a commodity, both in the context of the EU and its internal market, but also in view of international trade agreements such as CETA, TTIP, etc. They will open up health care for competition and a bigger role for private commercial providers and financial investors and insurance companies. They would also endanger regulations and state intervention in the interest of the patients, users and workers related to hospital or elderly care planning, staff-patient ratios, gender pay differences and occupational safety and health. • The pursuit of profit margins must never trump the duty of quality care to patients. Our health and wellbeing is not a commodity to be sold to the lowest bidder. We call on governments to reverse this dangerous trend and give healthcare the support and investment it desperately needs. • EPSU is committed to continue working against the commercialisation, marketisation and privatisation of health care, social services and social welfare/social protection together with civil society organisations representing the patients/citizens as well as in coalitions with bodies of social security institutions. Together we can mobilise, we are a powerful coalition and we can ultimately change policies! We need to start in our own countries, but we also have to change the policy priorities and concrete policies that directly or indirectly lead to more marketisation, privatisation and commercialisation of health care policies and services at EU-level. These key messages with a focus on the fight against the further privatisation, marketisation and commercialisation of health and social services and on measures to reverse already existing privatisations reflect some of EPSU’s priorities and demands for future EU-level health regulation and policies, as agreed by the EPSU affiliates organising in health and social care in view of the forthcoming elections for the European Parliament end of May. You can read them in EN, FR, DE, ES, SV and RU. At the congress of the ver.di sector "health care, social services, welfare and churches" on 1 and 2 April 2019 in Bad Neuenahr, Germany, ver.di colleagues had supported EPSU’s fight and mobilisation against and the the commercialisation, marketisation and privatisation of health care, social services and social welfare/social protection. This was also one aspect raised by EPSU’s General Secretary Jan Willem Goudriaan in his speech, covered in an article published by ver.di (in German). In a meeting on 5 April, the Board of the Trade Union for Health and Social Care of the Czech Republic (Odborový Svaz Zdravotnictví a Sociální Péče České Republiky) issued a message of solidarity: “We reject the commercialisation and privatisation of health and social services! The Trade Union of Health and Social Care of the Czech Republic is against commercialisation and privatisation of health and social services. At all events and negotiations we give clear NO to commercialisation of providing health care. This position was also expresed by the TU‘s Executive Board at the meeting on 12 March. 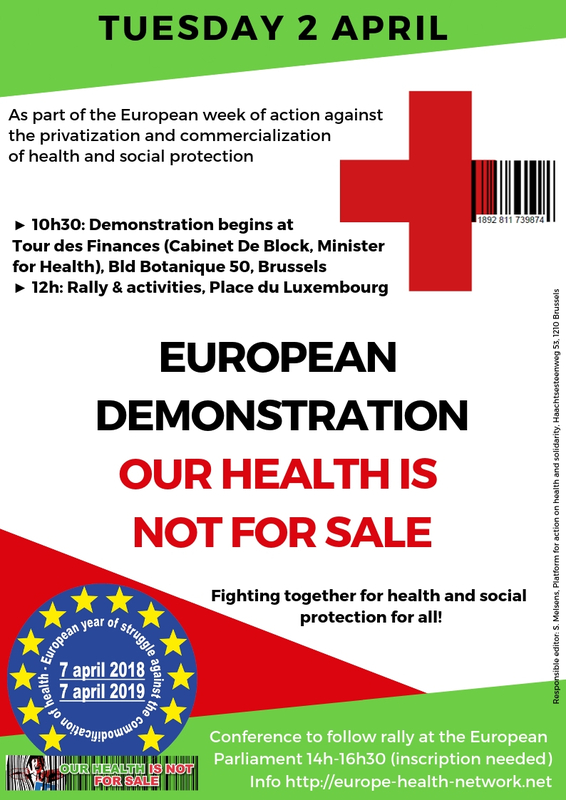 The Executive Board supports the demonstrations, which will be held on 2 April in Brussels and other cities as a part of the European Week Against Privatisation and Commercialisation of Health and Social Care. The Executive Board also fully supports the campaign 'Our Health Is Not For Sale!' of Public Services International (PSI)". PSI has issued a statement in support of their key demand and main campaign ”Health is a human right”, which is an opportunity to advocate for every woman, man and child to have access to quality public health. On World Health Day PSI calls for investment in public health systems and for putting health over profit for everybody in every country as commodification and marketisation of health care are major obstacles to attaining universal health care for all. Read the full article here.